If you missed the overview on the cleanse read about it here. Read about day 1 here and day 2. I woke up feeling great! I didn't feel low energy or light headed like yesterday. I am delighted that it is the last day, although I sort of feel like I could go longer. After watching that documentary " Sick, Fat and Almost Dead" where the main character does a 60 day juice cleanse, and some of the others do 10 days, I feel like I could almost go for 10 days.. ALMOST.. but not quite. I'll stick to 3 days for now. The urge to drown myself in lasagna has dissipated and I am excited to keep eating healthy after the cleanse is over. It definitely helps you put things in perspective, and makes you appreciate even healthy foods. So far, I am not feeling weak or tired like yesterday :) I am not sure if it's because I know the end is in sight or whether I am just getting used to it. I walked into the work kitchen to heat up my heating pad and there was a woman in there toasting a bagel. It was a cinnamon raisin bagel and just smelled so good. She had gotten half of it stuck in the toaster and her colleague was helping her get it out. It reminded me of a scene from the documentary where they talk about how everyone has a moment that will test them. The man in the documentary was doing a cleanse and was at a 4th of July barbecue. He was talking to someone and nearly stole a sausage off his barbecue because he wanted it so badly. I burst out laughing during this scene, but I can relate to it. This moment, in the kitchen, with the delicious smell of a cinnamon raisin bagel was my test. I actually thought, while they are distracted trying to get that half bagel out, I can just grab this half and make a run for it..
Craving attack. I am thinking about what I might eat tomorrow.. so many possibilities! Although it says to wean yourself slowly back to solid foods, that just doesn't seem likely at this point. I can't wait to eat an egg for breakfast tomorrow. I got a text from Rach saying that I inspired her along with the following photo. I miss my orange theory workouts. My foot seems to be getting worse instead of better :( The owner Karin sent me a nice message today. People at OTF are so nice! Woohoo, time seems to be flying by today. Anto came by and told me I am not grumpy and I am easy to be around. Excellent, I have her fooled. Actually, I do feel in a good mood. I think the best thing about this cleanse has been all the laughs. Laughter is the best medicine. The downside to drinking cold juice all day is that it makes you really cold! For some reason I am never in the mood for this second beat juice.. I know better than to even open this right now. 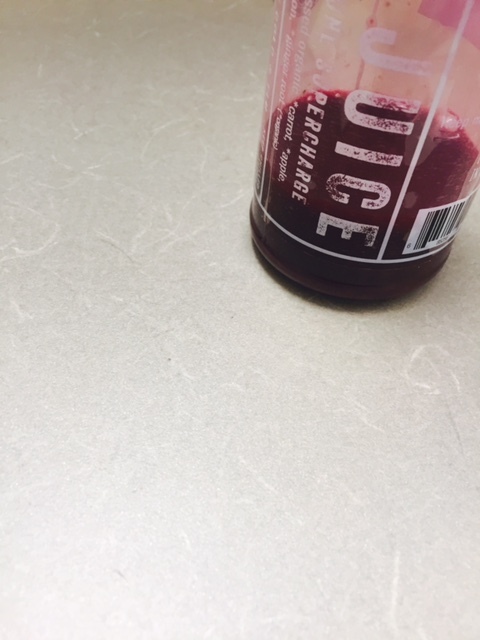 Juice #7-Time: 8:30pm late so starving! I survived ikea no problem. It's funny because I didn't feel out of it or foggy head, but I kept saying something different than what I meant. I would mean to say Home Sense and would say Linen chest. Repeatedly. Or other variations of the sort. It was so funny. Sean asked if I was on pain meds for my foot, and I said no, I'm on juice! I also managed to quickly pass by whole foods. I really wanted an avocado to eat with my breakfast tomorrow. I managed to leave with lettuce, avocado and a greek yogurt dip. If I hadn't been rushing home to drink my juice I probably would have left with a huge cart full. I guess I don't really need to wait until tomorrow to eat.. the instructions don't specify. But I have come this far..
Juice #9-Time: 10:00pm - it hasn't been 1.5 hours yet but lets get this over with. Yaaaaaaaaaay. I drank all the juices. Now for the easy part, sleep. I am very much looking forward to breakfast tomorrow!! Definitely craving something savoury. 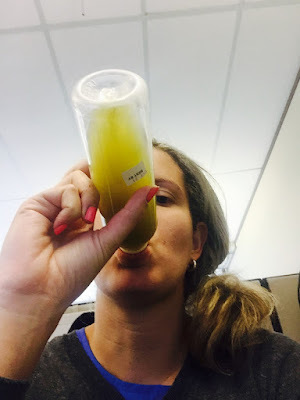 Read about the Post Cleanse.